I got the recommend of this recipe from my sister who found it on Heidi Swanson’s 101cookbooks.com web site. Made a few changes such as more beans and less olive oil… upped the garlic and rosemary also. It is an awesome recipe!! 2 – 15 oz. cans white beans (I’ve used Cannellini & Great Northern) or cook the dry beans and use 3 1/2 cups of cooked beans. In small saucepan, heat olive oil and add rosemary and garlic. Cook on low sizzle for 2-3 minutes and then remove from heat and let steep for 15 minutes. Pour through a strainer and set aside the olive oil. Rinse beans and put in medium size bowl. Add approximately 2/3 of the almonds to the beans along with the lemon juice, salt, 1/4 cup water and 4 Tbsp. Olive Oil. Puree the bean mixture adding additional water as needed to make a creamy paste to your desired consistency. Put the bean mixture in a serving dish (I use an oval shaped dish). 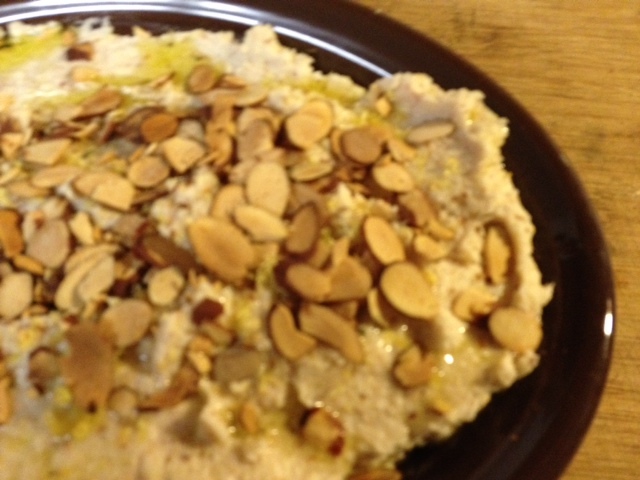 Drizzle the remaining olive oil over the top, add the lemon zest and the remaining toasted almonds. Serve with whole grain crackers, pita crackers, or veggies and enjoy! This entry was posted in Beans, food, hor dourves, vegetarian. Bookmark the permalink. Your bean dip sounds good with the addition of the almonds. Wishing you a happy holiday season. The almonds on top and mixed in the bean dip definitely add a nice flavor… like to think it’s semi-healthy too :-)… Thanks for the comment.